Ah, summer. It’s the time of year when things slow down just enough to enjoy gathering with friends over drinks and lazy dinners. But it’s also time for hot, sunny days, shorts and (gasp!) swimsuits! To help you enjoy the summer season completely (but a little less fully), Fleming’s has added two new low-cal additions to its “5 for $6 ’til 7” Bar Menu. Heineken Premium Light, a full-flavored beer that clocks in at a trim 99 calories, and a new, specially created vodka cocktail. Low-cal and cocktails don’t usually go together, but why should beer drinkers get all the low-cal fun? Fleming’s embraced the challenge of creating a summer cocktail, and it had three criteria… 1) It had to be refreshing, so citrus was a must. 2) It had to be fun and colorful. 3) The real challenge: it had to be under 100 calories. Creating this recipe was a bit like solving the Rubik’s cube, lining up just the right combination of delicious calories. A little more vodka here, a few less calories there…but finally, Fleming’s got it! Fleming’s guilt-free, 99-calorie cocktail, the Bikinitini. 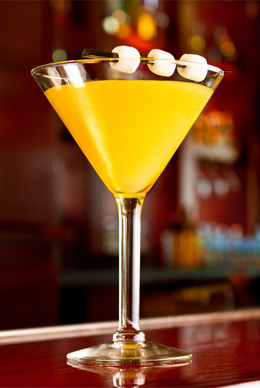 It’s garnished with three mini- marshmallows, as a toast to the eponymous yellow polka-dot bikini. Cheers! Shake all ingredients vigorously on ice to dissolve Splenda. Don’t be fooled by the distinctively full flavor of this Dutch brewed beer – it’s got only 99 calories per glass. Perfect with one of Fleming’s spicy appetizers!